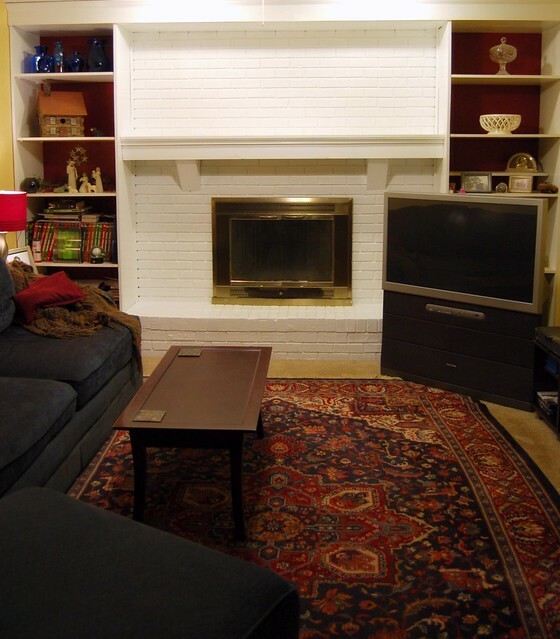 Here’s a reminder of my family room fireplace “before”. The room is really dark, with the only natural light coming from atrium doors to a covered (read: always shady) porch. This picture was taken with every light in the room on AND a flash on the camera. In real life, that fireplace looked more like a dark hole. 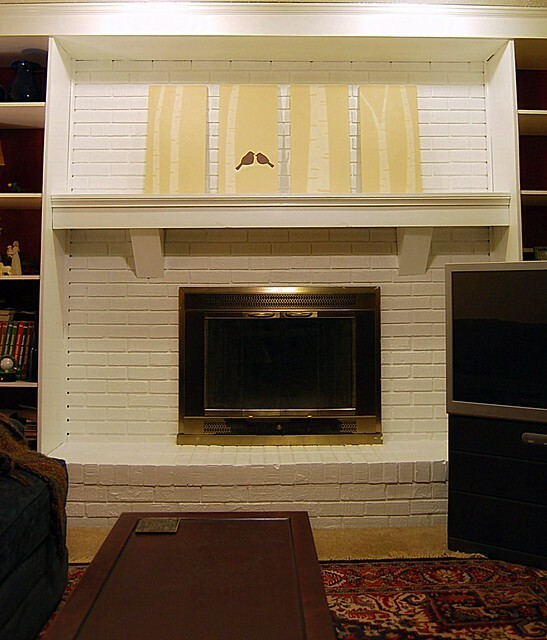 I found Young House Love’s instructions for painting a brick fireplace and they made it sound so easy, I decided to make it a weekend project. I went with white semi-gloss paint just because I already had a gallon. The first coat was a real bear. I wasn’t thinking about how each brick really has five surfaces to paint, AND there’s another layer deeper of grout surrounding each of those bricks. There’s a lot of paint “smooshing” to get into all those little spaces. The next coats were so much easier! It would have been fine with two coats, but I did one more coat just with the roller because it was quick and I had some paint left in the can. A tip: if you find little unpainted spaces in difficult to reach places, load a little paint on a Q-tip and dab it on. Now to decide what should go on the mantel. Maybe some sort of painting? These are a work in progress for our bedroom, just to give an idea how a canvas (or four) might look. Or maybe I need to invest in more locally made Blenko glass? I love how the white background really shows off the glass! Do you see the pop of orange to the lower left? 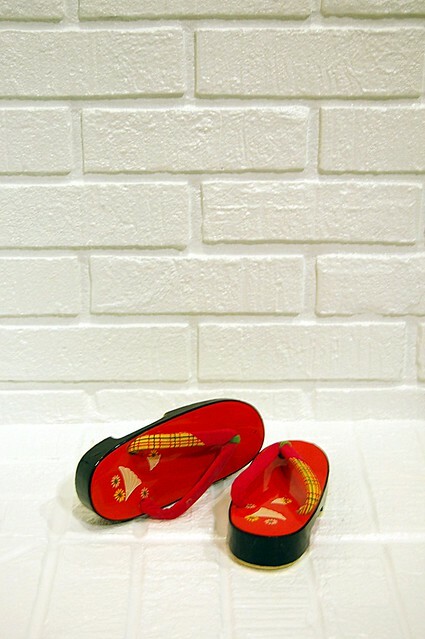 Those are little Japanese children’s shoes made by my friend Yuki’s parents. Did you even notice them in the “before” photo? They show up so much better against the white! 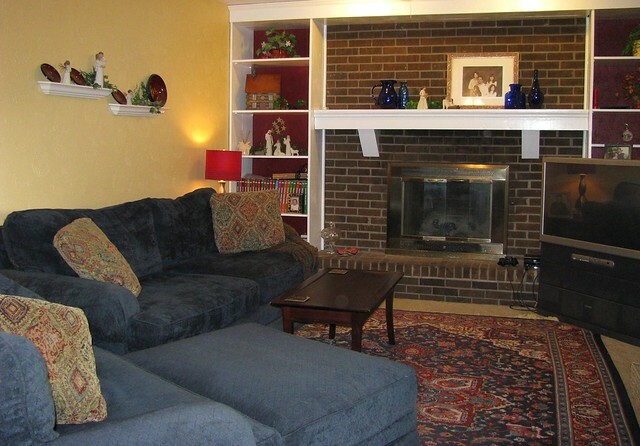 Do you have a preference for the mantel decor, or a suggestion for something else? I’d love to hear it! Hi Sarah, Love the white, what a difference.. I KNOW you don’t need another blog but I hope you will come over and join The Hive. It is a new community for artists and craftsmen that was created by Active Rain’s – Melissa Marro.. Here’s the link http://creatingthehive.com/signup/cherylgilliam and you can just import this blog by RSS feed..
Hope to see ya there, have a great day.. Thanks for the invite! I peeked a little at the hive, I’ll try to give it a better look later today. Sounds interesting! 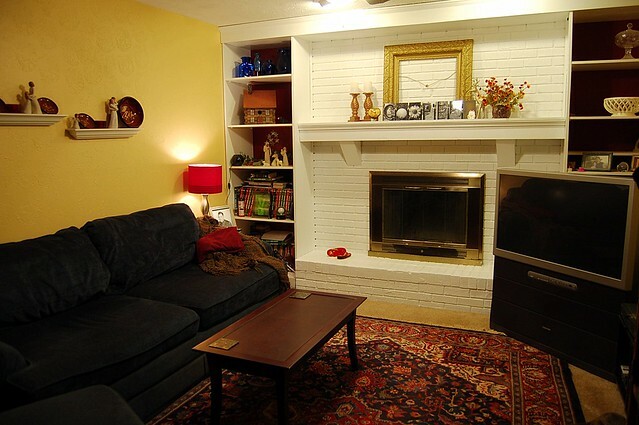 Actually, one of my future plans is to spray that brassy fireplace surround with a rubbed oil bronze fireplace paint. It’s not in bad shape, it’s just a dated style and I think that will help. I’ve read other blogs that have used regular spray paint on their fireplaces, but we get some real heat out of that thing, I’d better go with something meant to take it. I love the white. It looks like a different home now, doesn’t it? I also like the idea for going black on the fireplace surround. As for what to put on the mantle, I’m a sucker for an eclectic assortment. I think this space is talking to you so I think you should just keep on going with that inner voice and it will be great. I can’t wait to see it once you are all done decorating.